Our office has installed the GALILEOS three-dimensional (3D) x-ray imaging system. Conventional images taken in most dental offices are two-dimensional. Cross sectional or 3D images make the placement of implants safer, more predictable and more accurate. The GALILEOS 3D system generates a three dimensional model of the patient's jaw on a computer screen and the surgery is performed virtually before the procedure even starts. The GALILEOS 3D diagnostic system is a cutting edge dental technology that delivers superior quality images of your teeth with one of the lowest dosages of radiation. Dentists love GALILEOS because it helps them make a diagnosis quickly, easily, and accurately. 3D scans capture much more data than traditional x-rays. This scan gives Dr Rinehart an in-depth picture of your jaw, mouth, and teeth. He uses this information to determine whether cavities, abnormal growths, or other dental conditions exist--especially conditions that aren't evident from a traditional 2D panorex x-ray. 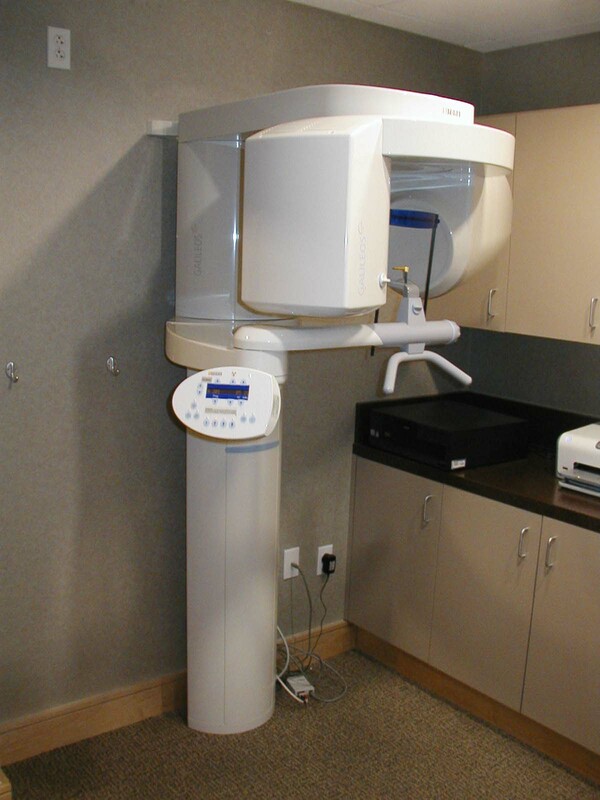 3D imaging enables Dr Rinehart to measure bone density, which is essential for placing dental implants. To determine whether a patient is a good candidate for dental implants, one of the primary things Dr Rinehart must evaluate is the thickness and quality of jaw bone. This is important because dental implants are permanently attached to your jaw. The jaw must be dense enough and healthy enough for implants to be possible and successful. With 3D scans, Dr Rinehart can gauge the thickness of bone structure to determine what size dental implants are appropriate for you mouth. In essence, the more information Dr Rinehart has about your mouth, the more precise and natural looking your implants will look and feel. One of the best things about the GALILEOS 3D imaging system is how comfortable it is for patients and how quickly it delivers comprehensive information to Dr Rinehart. It requires a patient to stand still for about 15 seconds while it travels around your head and captures about 200 images. That's it! It then takes about 10 minutes for the the computer to reconstruct the data and provide Dr Rinehart with high resolution images. If you have ever had a panorex taken, your experience with GALILEOS won't be much different. By having this technology available in our office, we don't have to send our patients elsewhere for scans, thereby making it more convenient and cost-effective. If you are considering dental implants, you have come to the right place. Less than 1% of dentists in the USA use GALILEOS, but we do because it is important to us that you receive the most accurate diagnosis and the highest quality of dental restorations possible. We are committed to providing our patients with the absolute best care possible.